Monday 1st It was a beautiful day. In the morning Willie riveted my spade, he then went down to the wharf to put his 12 Sacks of Charcoal on board the “Energy” which called in here at 10.20 on her way to Auckland. Willie and I were digging in this orchard, we dug round the Lord Wollesley Apple, 2 Evans Early Plums, 1 Burbank, 2 young Peach Trees. Tuesday 2nd It was a beautiful day. Willie and I were digging round the trees in this orchard , we dug round we only dug round 4 trees, as it was rather stiff digging, viz 1 Bonds Seedling Peach, 1 Hobbs Late Peach, 1 Evans Early, 1 Burbank. Wednesday 3rd It was a beautiful day. Willie and I were digging in the orchard. We dug round 4 trees viz 1 Burbank, 1 Irish Peach, then we took another strip up digging round the bottom Burbank and 1 October Purble. B. & B. Manure that I got from Harpers. Thursday 4th It was a fine day. Willie returned from Ti Point in the “Kawau” bringing some beef that we are getting from Auckland with Joe. Willie and I were digging in the orchard, we dug round 4 trees. 2 Early Orleans, 1 Satsuma and 1 Hobbs Late Peach. Jane returned from Matakana just after dinner having been to Warkworth since the Matakana Ball. Friday 5th It was a fine day, but the wind is blowing from SE. Willie went down to the Post Office in the morning to post some letters and he got the mail. Willie and I were digging in the orchard all day. We dug round 6 rees, viz 1 Early Orleans, 1 Nectarine, 1 Evans Early, 2 Orleans, 1 Green Gage. Saturday 6th The wind was blowing strong from SE. Willie and I were digging in the orchard , we dug round the top Green Gage tree, the small Vicar and Beurre Diel up to the fence and we then went down blow and started digging the piece that has not been dug for years as it is covered with cocksfoot grass, we dug round 1 Early Orleans and 1 Tibbets Plum making 5 trees. After an early dinner, Jane rode to Pakiri to be present at the Kia Ora tennis opening. There were several heavy showers of rain after dark. Sunday 7th It was showery nearly all day and the wind was blowing strong from SE. Jane returned from Pakiri in the pm. Monday 8th No rain fell, but it was a dull day, wind still blowing strong from SE. In the morning Willie made a slasher handle, I set two Hens in the house in the Pen with pure bred Brown Leghorn Eggs, 13 Eggs each, that Jane brought from A. Gravatts Pakiri yesterday. In the afternoon Willie and I were digging in the orchard, we dug round 2 trees, 1 Monarch & 1 Tibbetts. Tuesday 9th It was a beautiful day. Willie and I were digging in the orchard all day, we dug round 5 trees, viz 2 Dr Hogg Peach, 1 Tibbett, 1 Beurre Rose and 1 (reclining) Golden Russett. Wednesday 10th It was a beautiful day. Willie and I were digging in the orchard all day, we dug round 6 trees, viz 1 (Top) Tibbett, 1 (Largest) Vicar Pear, 1 Beurre Diel, 1 Loquat, 2 Kentucky Red Steaks. In the afternoon Willie carried down the Egg box and carried up the empty Egg box. Thursday 11th It was a fine day. Willie and I were digging in the orchard, we dug round 11 trees, viz 5 Golden Russetts, 1 Coes’ Late Red, 1 regrafted Nectarine, 1 Lord Wollesley, 3 Ohinemurio. About another half days digging will finish this orchard. Friday 12th It was a fine day. Willie went down to the Post Office after breakfast to post some letters. The “Kawau” came in from Auckland while he was down there, so he got the mail. We finished digging this orchard just after dinner, and then we started digging the piece of ground just under the bay window for vegetables. Jane went down to Uncle Johns and then across for the mail. Saturday 13th It was fine in the morning, but there were some rather heavy showers in the afternoon. Willie and I were digging under the bay window in the morning. In the afternoon Willie went over to Ti Point to fish. Jane went down to the village to play tennis. I staid at home and was digging and doing odd jobs. Sunday 14th I intended to go to Pakiri today, but when I got up in the morning it was very dull and there was a mist on the hill, but after a while it cleared off and the sun came out, so I started off on Empress about 10 oclock. I first went to Alf Gravatts where I had dinner, had a look at his pure bred Brown Leghorn fowls, also at his orchard, after that I called at Mr Wittens, with whom I had a long chat, I returned home by the old road arriving just in time for tea, I found Mabel Wyatt here, who had come to spend the afternoon with Jane . It had been a beautiful day and I enjoyed my little outing very much. Willie returned from Ti Point in the evening. Monday 15th It was a beautiful day, the wind has gone round to W. Willie and I finished digging the piece of ground below the house. Tuesday 16th It was a fine day. After breakfast I rode to Pakiri to get 2 sittings of Brown Leghorn Eggs from Alf Gravatt, returning in home just in time for dinner. Willie went down to the wharf to see if the “Kawau” had landed a bag of manure for us, but she had not, however we got the mail. In the afternoon we were digging against the fence below the closet, we rooted out the grape vines that were growing near the fence, but never used to bear. In the evening I went down to the village to meet the “Kawau”, but she was so late in coming that I returned home. Wednesday 17th There were a few slight showers, but they did not interfere with work. In the morning I set Two Hens in the fowl house. Pure Bred Brown Leghorn Eggs. Willie and I were digging between the Peach trees in the garden, we manured 2 drills for Pears. In the afternoon Willie took the Bullock down to the wharf with the box of Eggs and he hauled up 1 Sack of Steamed Bones, a box of Groceries, 56 lb Bag Sugar and empty Egg Box. After he came up he had tea and then he walked over to Ti Point to bring the beef round in the “Kawau” tomorrow morning. Jane went down to Tennis and then went to Mrs Archies Dunnings for tea and spent the evening there, and went home with Mabel Wyatt and slept there. Thursday 18th Willie returned from Ti Point in the “Kawau” in the morning bringing the beef. We were digging in the garden between the Peach trees. It was fine in the morning, but very wet in the afternoon. Friday 19th The weather looked as if it was going to be showery in the morning, but it passed off without any, the wind was blowing pretty strong from the SW.
After breakfast I went over to Mrs Dunning Senr to witness her signature. Willie went down to post some letters. Willie & I were digging between the peach trees in the garden. Saturday 20th It was a fine day. Willie and I finished digging the piece of ground from the peach trees to the path. I made a fire on the piece of ground below the house & burned all the rubbish that was dug out of the ground. I also made a fire in the orchard and burned up all the rubbish. The Tennis Season was opened in the afternoon on the court, there was a good attendance, the Club gave afternoon tea to all comers. There was also a dance in the Hall in the evening which was largely attended and was very enjoyable. Sunday 21st It was a fine day. Willie went to Ti Point to spend the day. Revd E. G. Evans held service in the Hall in the morning, Jane and I attended, there was a good congregation, Mr A. Kempt was to have been inducted Elder, but on account of illness he could not attend, Mr Evans brought two Elders with him to take part in the service, viz Messrs Holmes, McKinney & John Arxxour. Mrs James Greenwood came up with us to lunch. In the afternoon I went up to Mr Handbys, Mrs G going with me, I staid for tea. Maybel Wyatt was also up there. Monday 22nd It was a fine day. Willie sowed 2 rows of Stratagem Peas between the Peaches also 6 rows of Hollow Crown Parsnip below the house 12 inches apart. In the afternoon I went down to the store to get some Parsnip seed also down to the wharf to see Mr Torkington to ask him to get me some seed Maize as he was waiting there to go to town in the “Energy“. Jane went down to John Wyatts in the evening to stay. Wednesday 24th There was a nice rain last night, and it has softened the ground and freshened up everything. Jane came up from the beach in the morning to straighten up and return again in the afternoon, she brought up some Cabbage plants, Willie and I planted 4 rows of Cabbage (60 Plants) just below the house. Willie took the box of Eggs down to the wharf the latter part of the afternoon. Thursday 25th It was a fine day. We sowed 2 rows of Dunn Beans next to the cabbage. I went over to Joe Wyatts to get some Onion Plants, we planted 3 rows of Onions 259 plants between the peach trees, we hoed over the ground sowed bone dust and then dug it and raked it, then set a line and made a drill, sowing fine bone dust in it, planting the onions about 6 inches apart putting charcoal ashes round them. In the evening I went down to the Hall to get some books, I called in to the Tennis Court. Friday 26th It was very misty all day and several times it seemed as if it would turn to rain, but it passed off with out any. We planted another row of Onions containing 91 plants making altogether 350 plants. Willie also sowed between the Peach trees in the garden 2 hills of Pumpkins, seed given him by Albert Wyatt. In the afternoon I rode over to Dacres Cemetery to read the Funeral Service over Mr T. F. Ashton Senr who died at his residence Big Omaha aged 70 years. There was a large attendance , we sang hymn 264 “Thy Will be Done”. Jane came home in the morning bringing a wreath with her for me to take to the funeral. Saturday 27th It was a fine day, there were a few slight showers, but nothing to do any good and the wind has now got round to SW. In the morning Willie and I planted 10 Tomato Plants that Charlie Dunning gave me. Also planted out 6 Cabbage Plants own growing near the back gate, afterwards we were digging the top side of the house, we finished it out to the path at 3.30 pm. Jane went down to Tennis and in the evening she went back to John Wyatts. After we had finished digging Willie and I went down to watch the Tennis, I went to the beach to get some grit for the fowls also called into the Library to change my book. Sunday 28th It was a fine day. Willie and I went over to Ti Point to spend the day, returning home by moonlight. Jane is still down at John Wyatts. Monday 29th It was a fine day. Willie went down to the village after breakfast to post a letter, he was down at the wharf when the “Energy” came in, Joe & Harold brought round 20 bundles of fish to send to town , they gave Willie two schnappers to bring home. Willie heard that this was the last trip of the “Energy” as the Settlers Co have bought her. I planted 3 plants of Tomatoes and we planted 2 more rows of Onions that Minnie gave me. We have now over 500 Onions planted. In the afternoon we commenced digging the piece of ground in the garden near the fowl pen. I had 2 Hens bring out chickens, eggs from A. Gravatt, 24 hatched out of 26 eggs. Tuesday 30th A very fine day. We commenced digging in the farm orchard , started at the hedge, dug up to the 3rd Orlean. In the evening I went down to the Library to change my book. Called in to the Tennis Court. Wednesday 31st It was a fine day. 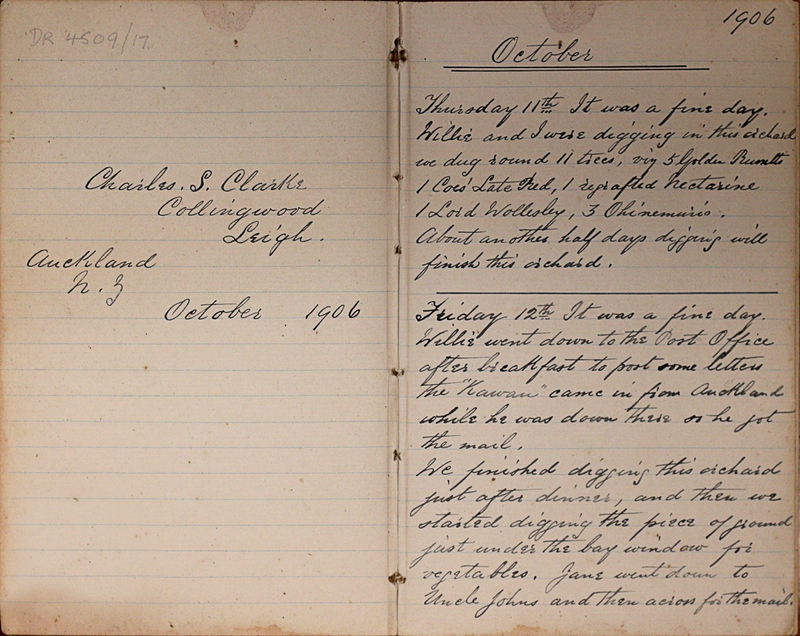 Mr J. Gilmour of Donald & Edenborough called in the morning just as we were sitting down to breakfast. Willie and I were digging in the farm orchard all day. The Bible Class Pin Nic was held in Mr A. Dunnings paddock and a concert in the evening. Noel Wallace came up in the “Kawau” to stay with us, he went with us to this affair. There was a slight rain in the evening which will do a great deal of good.